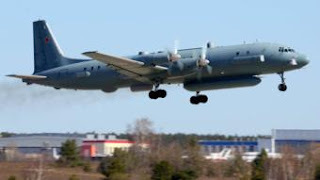 The leaders of Russia and Israel have sought to defuse tension after a Russian plane was shot down by Syrian forces amid an Israeli air raid. In a call to Vladimir Putin, Israeli PM Benjamin Netanyahu expressed regret at the loss of 15 Russian personnel, but stressed again that Syria was to blame. Mr Putin had earlier called the incident "a chain of tragic accidental circumstances". The Il-20 plane was downed over the Mediterranean Sea on Monday evening. Mr Putin and Mr Netanyahu spoke by telephone on Monday, shortly after the Russian president had made his conciliatory statement in Moscow. Mr Putin said at a media briefing: "It looks most likely in this case that it was a chain of tragic chance events, because an Israeli aircraft did not shoot down our aircraft. But, without any doubt we need to seriously get the bottom of what happened." Mr Netanyahu addressed that issue in the telephone call, offering to provide "all necessary information" in the investigation of the incident, as well as expressing regret over the fatalities. In the call, Mr Putin urged Mr Netanyahu "not to let such a situation happen in the future" and told him Israeli air operations breached Syrian sovereignty, Russian media said. Russia's Defence Minister Sergei Shoigu had earlier said that Moscow "reserves the right to take further steps in response". But Mr Putin said the "retaliatory measures" would be "aimed first and foremost at further ensuring the safety of our military personnel".